It is the time of the Darkfall in the world of Aden. This mysterious blight taints the land with its spawn, rampaging horrors known only as nocturnals. Great warriors ride across the scarred lands to battle these hordes. Powerful mechamages wield deadly contraptions of steam and magic, or fight the evil with incredible sorcery. But unless heroes are found... and soon... Aden will fall. 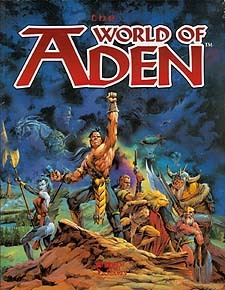 The World of Aden features everything you need to start a roleplaying campaign in this exciting fantasy setting. You'll learn about the kingdoms of Aden, the Orders that serve them, and the hideous nocturnals that threaten their very existence. Delve into the secrets of mechamagic; ride on the awe-inspiring thunder trains; battle to save a world from overwhelming evil. Also included are character tempates for use in the World of Aden, new equipment, spells and Background Options. The World of Aden is compatible with both West End's MasterBook and D6 systems.